Catholic musician of the NLM: Cabrini College Gone Traditional?? As you can see, it is set up so that mass is said from the middle of the chapel, which is just ridiculous, and does not follow the norms laid down by the church. What is new to the sanctuary is all the woodwork along the walls and coming out toward the center, and the tall windows and the layered look to the back wall. I think it is simple and beautiful. It reminds me of a choir for monks because you can sit all along the inside now against the wall. 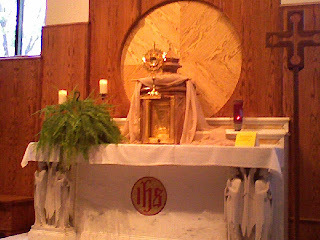 Before, there was just a small step up and just the altar in the middle, and a couple of those chairs placed in front to be able to adore the Eucharist when it was in the tabernacle. I was told that the renovation was donated by someone, and otherwise, they wouldn't have done such a thing. I remember last year when i wrote to the school (for lack of knowing who to address) about the inappropriateness of the setup of their sanctuary and missing elements according to Vat. II documents, and was made to feel like some sort of criminal, like i had done something wrong for addressing the issue. the school or chaplain (who is a franciscan priest from Villanova) didn't even talk to me about it, instead they had Eastern's chaplain talk to me about my concerns about Cabrini! It was pretty odd. And the only thing told to me by the Franciscan priest was: "we aren't going to change the chapel to fit your tastes" and it was not in a very nice tone either. So needless to say, i hadn't gone back there till now and i still won't for mass, but i think i'll go more often to adore Christ, who desperately needs it there since this past Wednesday i was the only one to adore the Sacrament that was exposed except for the priest. Obviously, there liberal liturgy and soft catechesis isn't drawing any of the students to the faith....(or the drums and piano music). But maybe, just maybe, this renovation will be a first step to something better... and a new chaplain in the future. Wow that really is beautiful. I think your final comment was unnecessary though. 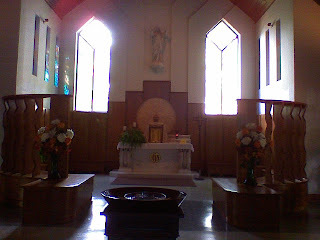 The pervious blog about Cabrini College's chapel is very in accurate. Mass is given every week on Sunday evenings and during the week so staff and students as well as community members can attend. Second the lay out for the chapel is not out of the ordinary if you would have taken the time to look at other area churches you would find that they to are set up in this manner so that the parish members can face one another and they can get to know one another. 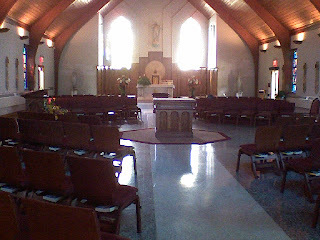 The chapel is something that we take great pride in I find it hard that no one would have been happy to help you considering I worked in campus ministries during my time there I can say without a doubt that someone other than a member of the Cabrini community would have addressed your questions. The renovation was completed by donations and funraisers from alumni and supporters and was in the works for several years. Also I would like to say that the campus priest is not a fransican from Villanova he lives on campus among the students always helping and guiding them during their time at Cabrini and afterward. You should probably get your facts straight before yous start to critize a wonderful place that you know nothing about. Also more than 60% of the students of Cabrini attended Catholic high schools and nearly 40% attended mass on campus and those who did not attended mass at their home parish since the majority of the campus goes home on weekends. Once again check your facts otherwise to try to act like you know what you are talking about.